SEM images of the PEG4–b–PE25 treated fabric (A and B) and a 10 by 10 µm Raman chemical functional map (C) showing the presence of copolymer on the surface (black is the substrate, red is the PEG4–b–PE25 copolymer). In order to overcome interfacial incompatibility issues in natural fibre reinforced polymer bio-composites, surface modifications of the natural fibres using complex and environmentally unfriendly chemical methods is necessary. In this paper, we demonstrate that the interfacial properties of cellulose-based bio-composites can be tailored through surface adsorption of polyethylene glycol (PEG) based amphiphilic block copolymers using a greener alternative methodology. Mixtures of water or water/acetone were used to form amphiphilic emulsions or micro-crystal suspensions of PEG based amphiphilic block copolymers, and their deposition from solution onto the cellulosic substrate was carried out by simple dip-coating. 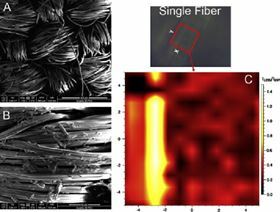 The findings of this study evidence that, by tuning the amphiphilicity and the type of building blocks attached to the PEG unit, the flexural and dynamic thermo-mechanical properties of cellulose-based bio-composites comprised of either polylactide (PLA) or high density polyethylene (HDPE) as a matrix, can be remarkably enhanced. The trends, largely driven by interfacial effects, can be ascribed to the combined action of the hydrophilic and hydrophobic components of these amphiphiles. The nature of the interactions formed across the fibre–matrix interface is discussed. The collective outcome from this study provides a technological template to significantly improve the performance of cellulose-based bio-composite materials. This paper was originally published in European Polymer Journal, 64 (2015), Pages 70–78.